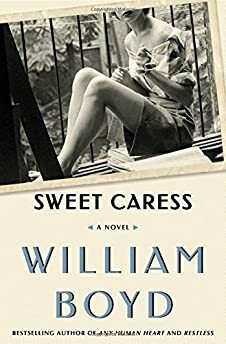 Largehearted Boy: Book Notes - William Boyd "Sweet Caress"
Book Notes - William Boyd "Sweet Caress"
William Boyd's novel Sweet Caress is a sweeping account of the 20th century as seen through the eyes of a British photographer. "Sweet Caress is an audacious, sweeping, rich layer cake of a novel, at once a textual hall of mirrors and a brilliant tale of a life well lived." Sweet Caress: the many lives of Amory Clay is a novel about a woman's life, from cradle to grave. Amory Clay (1908-1983) was born and grew up in England and she becomes a professional photographer, a job that allows her to travel to places and see things and confront aspects of life that another profession wouldn't. It's a rackety and adventurous life covering a great swath of the 20th century with more than its fair share of emotional highs and lows. To my vague surprise there's quite a lot of music mentioned in Sweet Caress. I say "surprise" because I must have put it in instinctively, rather than deliberately. I listen to music all the time -- classical, jazz, rock, world music -- so as well as the "soundtrack" contained in the novel there's also a soundtrack in my head that complements the writing of the novel. This list is a mixture of the two. An asterisk demarcates the song or the music that I was thinking of but didn't actually include in the novel. Amory was born in Edwardian England before the First World War. Delius's music – particularly his tone poems -- always conjures up that period of history for me, that sunlit Neverland before the cataclysm of the Great War arrived. Amory's first job is as an assistant to a society photographer, her uncle Greville. This takes her to all manner of grand parties and festivities. At one party in Mayfair she spots the Prince of Wales (later Edward VIII). He's standing outside a ballroom and the band is playing "Ain't She Sweet". The date is 1927. A song made famous by Frank Sinatra in the 1950s was actually written in 1930, so I was astonished to discover. In 1931 Amory goes to Berlin to photograph the demi-monde of the Berlin underworld. In a nightclub she sits listening to the band play this song. Another song that effortlessly conjures up Europe between the wars. It is most frequently heard sung by Jean Sablon but it was in fact written in 1936 by a German, Rudolf Goehr, a pupil of Schoenberg, incidentally. Although the lyrics are French the song sounds to me as German as "Lili Marlene". Amory's sister, Peggy, is a piano virtuoso. She changes her name to Dido, the better to advance her career. The day Amory finds out about this transformation, Dido Clay is playing in a recital that includes Chopin nocturnes. "Bobby Shafto" is a British folk song and nursery rhyme. The first line is "Bobby Shafto's gone to sea". Amory's daughter, Blythe, adapts it after her father's death. His name was Sholto Farr and the first line becomes "Bonny Sholto's gone away". Dido Clay comes to America in 1941 to take part in concerts designed as a patriotic drive to encourage the USA to join the war in Europe. Elgar – another quintessential English composer – is part of her repertoire. Amory is living in New York at the time and the two sisters meet for lunch in the 21 Club. Buxtehude: "Passacaglia in D minor"
Dieterich Buxtehude (1637-1707) was a Danish-German organist and composer. At the funeral of Amory's father, Beverley Clay, in 1944, Dido plays the organ in the church, playing the Buxtehude as the mourners file out. During WW2 and afterwards, Amory enjoys a long love affair – both intense and frustrating -- with a French novelist called Jean-Baptiste Charbonneau. This song, along with "La Vie en Rose" sung by Edith Piaf, sums up all that is wonderful about France. One of the most haunting of Scottish folk songs, commemorating the flight and escape of Prince Charles Stuart, Bonnie Prince Charlie, "over the sea" to the island of Skye. Amory, at the end of her life, is living on a small island off the West Coast of Scotland, not far from Skye. It was a measure of Dido Clay's renown that she claimed that Béla Bartók composed a horn trio and dedicated it to her. Perhaps it was one of these 13 pieces. In 1967, in her role as a war photographer, Amory goes to Vietnam. Suddenly the air is full of ‘60s rock music. In a Saigon night club she hears this Stones number belting out. While she's in Vietnam Amory realises she's developing a taste for American soul music, in particular Aretha Franklin. This is a 1967 hit that Amory would have heard playing in the clubs and bars she frequented. In Vietnam, Amory has an affair with a young Australian journalist called John Oberkamp. The night their affair is consummated, Amory, a little drunk, remembers listening to Dionne Warwick's classic hit. Strauss's great tone-poem is famously used by Stanley Kubrick in 2001: A Space Odyssey -- a film that Amory goes to see in Los Angeles on its release. She is in LA searching for her daughter, Blythe, who's gone missing. Amory's daughter has a career in the LA music scene. She plays and writes songs for a band called Franklin Canyon Park in the late 1960s. Franklin Canyon Park modelled themselves on Crosby, Stills & Nash. As the end of Sweet Caress approaches, so too does the end of Amory's life draw near. The mood is both melancholic and celebratory. Celebrating life's potent but transient pleasures, life's "sweet caress". Mahler's sublime adagietto from his 5th symphony captures the mood perfectly.